By now, readers will know that our company operates public parks and campgrounds in the National Forest without taking one dime of Federal money. We pay for the cleaning, maintenance, utilities, and staffing of the facilities entirely from the user fees paid by visitors at the gate. Because we take no government money(we actually make lease payments to the government) we have never been closed in past shutdowns, but we were closed last week as the White House overruled an early Forest Service decision and ordered us closed. Well, here is a photo from yesterday of the parking lot of one of the recreation areas we operate and were forced to closed. Doesn't look very closed, does it? As it turns out, yesterday the local Sheriff was concerned with traffic jams on the highway near here as people tried to park and walk in. It is a danger I warned the US Forest Service about way back on October 2 in a letter to Cal Joyner, the Regional Forester for Arizona and New Mexico (and was promptly ignored). The Sheriff forced the gate open and let everyone in. The amazing thing I found out today, and confirmed through pictures and news reports, is that the Sheriff was accompanied by US Forest Service personnel who apparently accepted this action. This means in effect that the US Forest Service believes this site is safe to occupy by visitors without our company present to clean the bathrooms, take out the trash, monitor security, watch for fires, stop vandalism, etc. but is not safe, somehow, with us present and actively staffing the site. This obviously makes no sense and just points out how arbitrary the decision-making has been. Starting yesterday morning I begged the US Forest Service to let us return to staffing the site (which should be an easy decision since, unlike opening National Parks, this would require zero dollars from the government) but I got no response. We have also found numerous other sites operated by third parties like ourselves on US Forest Service land in Arizona still open. For example, the Oak Flats campground in the Tonto National Forest is still open for business. 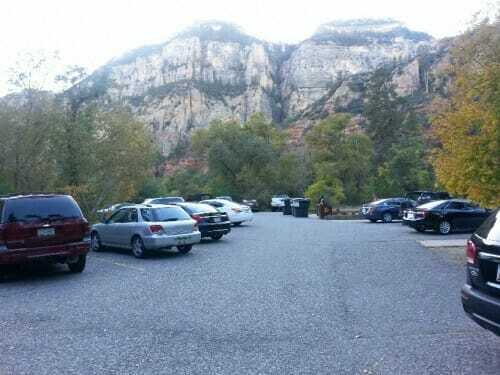 In addition, we know of at least three Arizona State Parks, including Slide Rock SP, that operate on US Forest Service land just as we do but who have not been ordered to close. I know that Fool Hollow SP operates with a special use permit very similar to ours, but unlike us, its permit has not been temporarily suspended and it is open for business. In fact, I cannot find a single third party who operates on the National Forests in Arizona who have had their operations suspended except for the private campground concessionaires. The powerful ski associations got their operations on Forest Service lands exempted from the get-go, probably because they have a full-time lobbying staff in DC and I do not. The same goes true for BLM lands, where the BLM has not closed its campgrounds or parks to the public. And the same goes true now for the Grand Canyon NP, which has been reopened by the state of Arizona. In fact, we may be the only recreation operations on Federal land in this state that are still required to close. Update: The Forest Service made us cease operations at the Locket Meadow campground near Flagstaff. After kicking us out, they have reopened the campground to the public (without any staff or services on site). It is absolutely outrageous that the US Forest Service believes that the campground is fine for public visitation but that our company must be banned from operating it. Clearly, the resource and the visitors are safer and better protected and better served with us there, so this can only mean that the Forest Service is for some reason arbitrarily targeting our business, rather than use of the land, for shutdown. I cannot think of any possible justification for this action. If the campground is safe for public visitation during the shutdown, it is safer for us to operate and keep clean and protected. PS- I should say targeting private SMALL companies. Large companies with political pull seem to be getting the National Parks open where they have operations. Just like with Obamacare and nearly everything else in modern government, restrictions are passed on private enterprises but exceptions are granted to those large enough to have staff lawyers, full-time lobbyists, and who can bundle a lot of donations.